Bananas are harvested and shipped while they are still green. When the banana is cut from the plant it begins to ripen. Depending on how far in advance you purchase the bananas you may wish to select bananas that are already ripe or bananas that are slightly green which still require some ripening time. Choose bananas that are bright in color and full and plump. Avoid bananas that have bruises. Bananas which are ripe have no green on the skin. Bananas with a skin that contains small brown specks will have the fullest flavor. Too much brown on the skin means the banana is overly ripe. Green / Yellow bananas can be stored at room temperature for a few days. 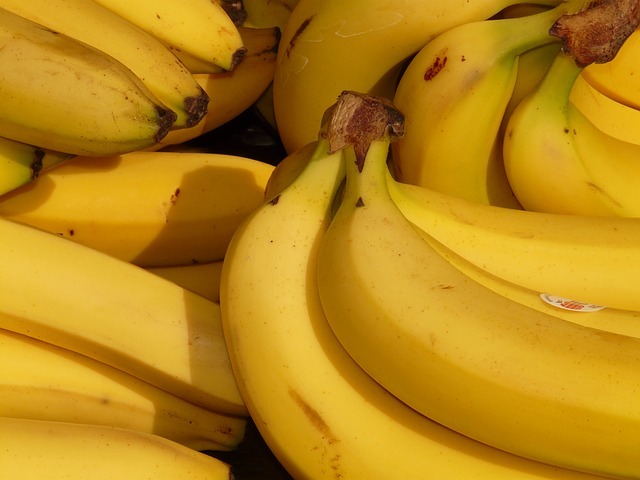 When bananas begin to develop spots they can be stored in the refrigerator to slow down the ripening process. Do not store bananas in plastic bags, they hold too much moisture and can cause the fruit to rot. To freeze ripe or slightly overripe bananas simply peel them, put them in a freezer bag and place them in the freezer. They can be frozen in the peel as well however, they last longer out of the peel and the banana is extremely mushy after it has been frozen so peeling after freezing is a little more difficult and messy. Bananas can be frozen whole, in chunks or mashed. To freeze mashed, peel the banana, mash it in the food processor, blender, or by hand, add 1 tablespoon of lime or lemon juice for each 1 cup of banana, and then pour in an airtight container and freeze. If bananas are too green when you purchase them, they can be stored on the counter to ripen but if you’d like to speed up the process put them in a brown paper bag and fold it closed to trap the ethylene gas they produce. This will help the fruit to ripen quicker. To make the process even faster, add an apple or tomato to the bag.